Today women make up almost half of the workforce in the world, and women farmers are one of the fastest growing segments in the United States, making up a third of our farmers. In a moment of rapid changes to the environment and how we grow food, women are coming up with innovative solutions to our current global challenges. 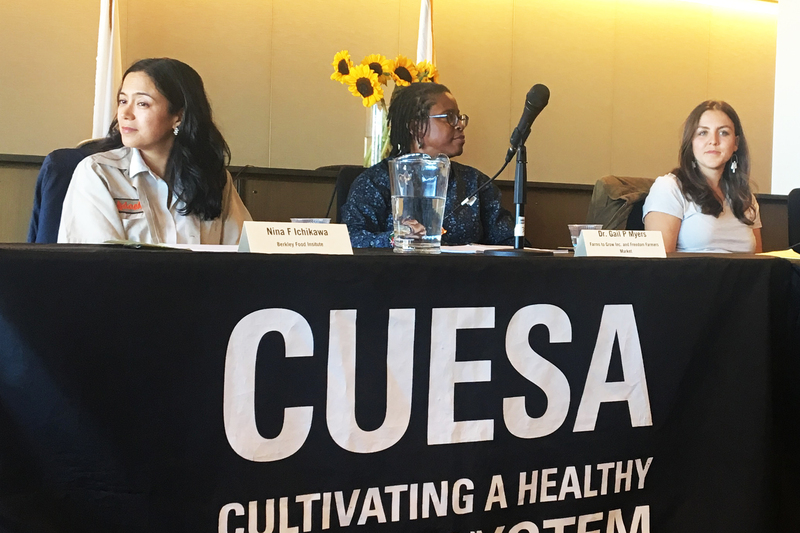 On Monday, CUESA hosted its first panel talk of the season featuring women farmers who are continuing the long-standing tradition of sustaining the health of our communities, each in her own unique way. CUESA was joined by three Bay Area women farmers and innovators: Marsha Habib, farmer and owner of Oya Organics, Helena Sylvester, farmer and owner of Happy Acre Farm, and Dr. Gail P Myers, founder of Farms to Grow Inc. and Freedom Farmers Market along with moderator Nina Ichikawa, Policy Director at the Berkeley Food Institute. With women being underrepresented and undervalued in nearly every career field, farming is no exception to that. From the size of farm equipment to maternity leave, each woman has to overcome different challenges in the field. In a report by the United Nations Food and Agriculture Organization (FAO), they suggested that if women farmers had equal access to resources such as education, land, and credit, they could increase their food production by up to 30 percent and help bring as many as 150 million people around the world out of hunger. Dr. Myers believes that women farmers having access to land is one of the biggest challenges they face when trying to get into farming. Women farmers, and small farmers in general, often wear many hats ranging among being out on the fields, accounting, and selling at the farmers markets. And then there are women farmers who are also balancing farming and motherhood. Since the birth of her son in March, Helena of Happy Acre Farm splits the time with her husband of being in the fields and with her baby in the office. Marsha of Oya Organics and her husband also take turns with their baby and farm work. “You are 50% of the workforce on your own farm. Taking maternity leave would mean the work would be left undone,” says Marsha. Both Helena and Marsha wonder what paid parental leave would look like and how would help women farmers prosper and continue to farm even while raising children. “I had to take a forced leave for 8 weeks because I had a C-section…and I wanted to get back to work earlier than when my body was ready to get back to work,” says Helena. Helena has paved the road for other women farmers and opened a new door by hiring two women as their first crew members at Happy Acre Farm. Marsha and Helena also proposed that farmers markets have some form of child care for women farmers who want to continue selling at the market while raising children. With new immigration policies and raids around the country, some farmers worry about how that is affecting their farm worker force and their communities. Women farmers are standing in solidarity with the immigrant farm workers who continue to put food on the tables of American households, and hope that the community also joins them in protecting this vital labor force. When asked why they continue to farm despite all the obstacles small farmers face, they agreed that they couldn’t imagine a life without being able to nourish their friends, family, and community. “I like to feed people…it makes me feel like my life has a purpose,” says Marsha. 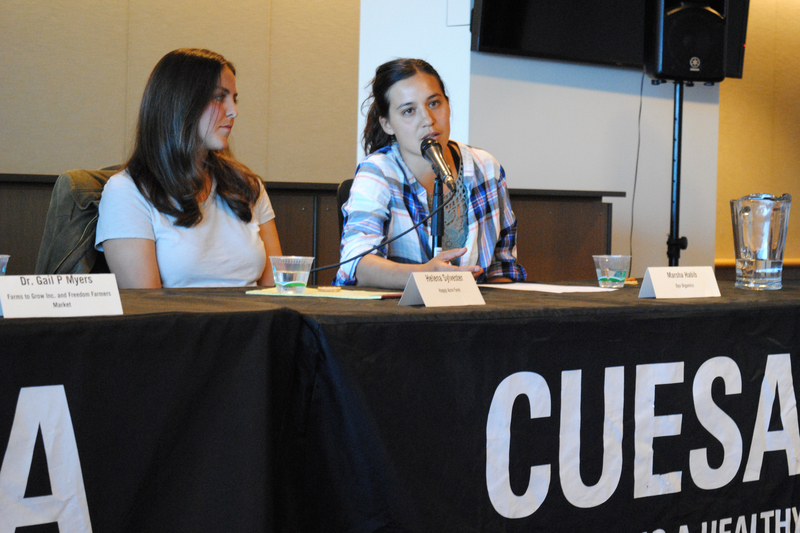 Join CUESA at the next talk in this series, The Future of Food: Recentering Our Origins, on Monday, July 30.